The way I see it, a game that's been around for as long as rugby has is going to have some famous players. Here are a few. Prince William and Prince Harry: Well, of course. William will be king some day; what other sport would be appropriate for a future king? Badminton? An Internet correspondent has this: "Prince William as an Eton Rugby player; he is not that good and is on the third XV; a friend of mine was coaching a Catholic school team against that side and before the game told his players that they would have a chance to tell their grandchildren that they tackled the King, so every time William touched the ball, he would be descended on by the entire team. At the end of the game one of the boys walked up to him, shook his hand, and said 'My mum has a cat named after you.' William had no comment." Trevor Rees-Jones: Princess Diana's bodyguard and the only survivor of the car wreck, which claimed her life. While standing in line at the grocery checkout I saw his picture in a National Enquirer. He's described as playing in a "semi-professional" club in England (Oswestry in Shopshire, perhaps?). The photo indicates he's a lineout jumper. Bill Clinton: No doubt rugby has done more for him than he has done for the game. (Or the office of the Presidency, for that matter.) He played in England while a anti-war protestor and part-time student. A rugby site on the Internet maintains that he was a "...rather lumpy, but excellent" second row forward for the Little Rock (Arkansas) Rugby Football Club. However, my source at the Little Rock RFC says he never played for them. Candace Gingrich: The sister of the former Speaker of the House. Plays for the Washington Furies. Boris Karloff: He founded the Southern California Rugby Football Union in 1935. Neck electrodes or no, I think he must have been a forward, if he played. (I'm not sure he did.) From what I read he was a big cricket fan as well. Sean Connery: Played school-boy rugby and his son (Jason?) lived in Minnesota at one time and played for Minneapolis. Pope John Paul II? : An Internet site maintains that he played for Poland, but the official Vatican web site has a questions and answers page that addresses this rumor. It says - in answer to a direct question about rugby - that as a youth he played soccer as a goalie. I have to believe the Vatican (in this matter). David Niven: Such an elegant guy - he must have been a back. He also played a rugger on the screen, I'm told - but I don't know in what film. Richard Harris: He also portrayed a rugger in "This Sporting Life." Jim Baker: You remember him from Reagan days, perhaps. (Not Jim Bakker, the defrocked priest.) He played at Princeton. George Allen: Recent former governor of Virginia, played for Virginia RFC in Charlottesville. Billy Campbell: Another former Virginia RFC player; he was "the Rocketeer" in the movie of that name. Ernesto "Che'' Guevara: Marxist guerrilla legend in Cuba - he played in Argentina, according to Reuters. Richard Burton: One correspondent told me he recalled seeing mention in Rugby World that this famous actor played for Combined Services or the R.A.F. He was Welsh, it doesn't surprise me. Story: When Richard Burton heard that his club team did not have a clubhouse to go back to and had been barred from every pub in the district, he bought them their own pub, where after the match, they and their opponents retired to an upstairs room and could be as noisy as they wished. John Steed: Who? You know, the dapper, bowler-hatted Avenger played by Patrick McNee who fought bad guys with Emma Peel (Diana Rigg). In one episode he admitted that he "...played rugger at university." In another episode he reveals that he was a wing three-quarter (#14). I'm sure he also excelled at cricket and darts. Andy Capp: The little working-class bloke in the comic strips by Reggie Smythe. He dabbles in football (soccer), rugby (probably league, not union) and snooker. My guess is he plays darts, too. Fran Tarkenton - The Hall of Fame quarterback was in a deodorant commercial several years ago playing a scrumhalf. I was not able to find independent confirmation, but I heard several years ago (before the commercial) that he actually played. Gary Anderson - The Vikings kicker who didn't miss a field goal last season until the Super Bowl was on the line was born in South Africa. His early days kicking a fatter ball have been frequently documented in NFL telecasts. Chris Farley - Did you notice the Marquette Rugby Jacket in "Tommy Boy?" Chris went to Marquette and played rugby. He showed up at his first practice wearing baggy shorts and a pink polo shirt. During matches he would hike his shorts into sumo mode. Don't we all know one of these? [Hmmmm. What position would Chris Farley have played? Let's see.... could it have been... PROP? 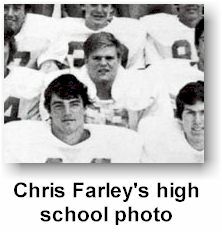 - Wes] Click here for a photo of Farley as a high school football player. Click here for an Idiot Brother story about Farley as a prop. Jim Murphy- Creative partner in Pixar Entertainment and Chris Farley's roommate and team mate at Marquette. The Wilmington, Delaware Rugby Mafia - For years, the power structure of Wilmington, Delaware and the Wilmington Rugby club were one and the same. Late mayor Dan Frawley played and had the city's minor league stadium named after him. Former mover and shaker (and now convicted murderer) Tom Capano was often identified by his rugby connections prior to his arrest for killing his estranged girlfriend. (Goes to show that we can take our misogyny too far.) The Wilmington connection has been documented several times in Rugby Magazine. Frank Blee - Maybe a stretch, but the New Jersey assemblyman from Atlantic City was my team mate and a prop at Dickinson College 1978-80. Roh Tae Woo: President of South Korea; served during 1988 Olympics. Tony O'Reilly: Chairman of Heinz Foods is a former Irish International and also a former British Lion. From an O'Reilly bio: "A world-class sportsman, Dr. O'Reilly played rugby for Ireland 29 times and for the British and Irish "Lions" team 10 times. He is a member of the Test Series winning British Lions Tour of South Africa in 1955 and of the Tour of New Zealand and Australia in 1959, where he established scoring records on both tours that have remained unbroken." He once told a story of when he played England at Twickenham and found that he had forgotten to bring laces for his boots. No other Irish player had spares so he went to the England dressing room to ask if they had any spare laces. Outside the door he heard the England captain exhorting his players to smash the Irishmen from the bogs and to trample anyone that got in their way. O'Reilly waited until he reached a climax, stuck his head round the door and asked, in a very pronounced Irish accent, if anyone had any hairy twine they could spare for him to tie his boots on. David Dixon: Offensive guard, Minnesota Vikings (must be something about the Vikings), 6'4", 350 pound former lock from New Zealand. Walked on in Junior College, transferred to ASU, and has now had a good career in the NFL. He just signed a four-year, $10 million contract, so he can compare net worth with Jonah Lomu. Thomas Dolby: When not blinded by science, he played until his hands became too valuable. Mick Luckhurst: Former NFL kicker had bigger balls in England. Tom Foley: Pennsylvania Senate candidate and Commissioner of Labor. His playing while doing humanitarian work in Ireland is well documented. Steve Tasker: Too small to be drafted by the NFL, he took up rugby in the spring of his senior year at Northwestern. From what I understand, they used him at flyhalf. Then the Bills drafted him and he went to about ten Pro Bowls as a special team specialist. Andre the Giant: Played as a kid in France. Ernie Els: Played as a kid in South Africa (if you can believe that) until his gift for golf became apparent. And one who became famous, then played rugby: Tom Okon: Who? If you're over 30, you know him. The kid in the Mean Joe Green Coke commercial, gets Green's Jersey for a coke. Went on to play High School rugby at Fordham Prep. Joe, an Internet correspondent, adds: Mark Cuban, current owner of the Dallas Mavericks basketball team and founder of broadcast.com (now Yahoo! Broadcast). He supposedly played at Indiana University according to an article in the Dallas Morning News. More of Brigham's scribbling can be found on his rugby web site, "the Rugby Reader's Review."